Footwear and outdoor clothing specialist Timberland are running a ‘free bag’ give-away campaign over this festive holiday season. This recyclable packaging, rPET shopping bags, are produced from recycled plastic bottles and feature images from Timberland’s Christmas campaign. They are being given away free to commuters in the hustle and bustle of the London underground. 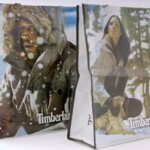 Timberland were introduced to the rPET material when they saw Disney’s rPET shopping bag. Excited by the print quality as well as the bag’s environmental credentials, Timberland were keen to develop their own version. Around 70,000 will be given away across the capital during the run up until Christmas.